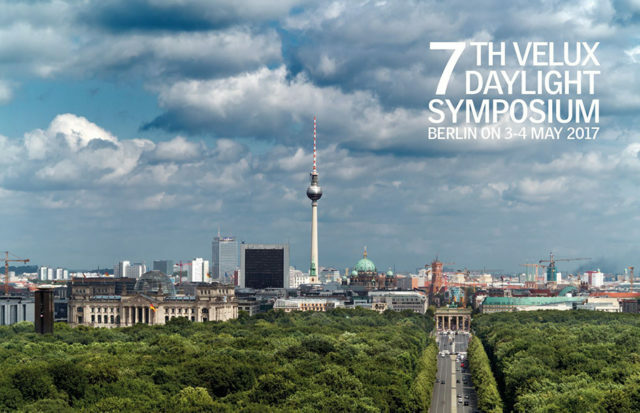 We are pleased to announce the 7th VELUX Daylight Symposium, to be held at Café Moskau in Berlin on 3-4 May 2017. The theme of the symposium will be “Healthy & Climate-Friendly Architecture – from knowledge to practice.” It will focus specifically on the use of daylight – firstly to create buildings that promote human health and wellbeing, and secondly to minimize the negative impact of man-made structures and activities on climate change. It is crucial that we rethink the way we design our homes, workplaces, schools, public places, cities etc. to address the challenges faced by modern societies, where people spend up to 90% of their lives indoors. How can architecture and daylight interact to stimulate our senses? Can we find a new paradigm for architecture and the way we live using insights derived from lighting, medical and architectural research? What are the mechanisms to transfer knowledge from research into practice, and how can they be accelerated through building policies? These questions will be addressed and debated with presentations from research, as well as experiences and viewpoints from engineering and architectural practice as well as policy makers – covering a range of aspects related to the use of daylight, while considering people, politics, economy and scale.